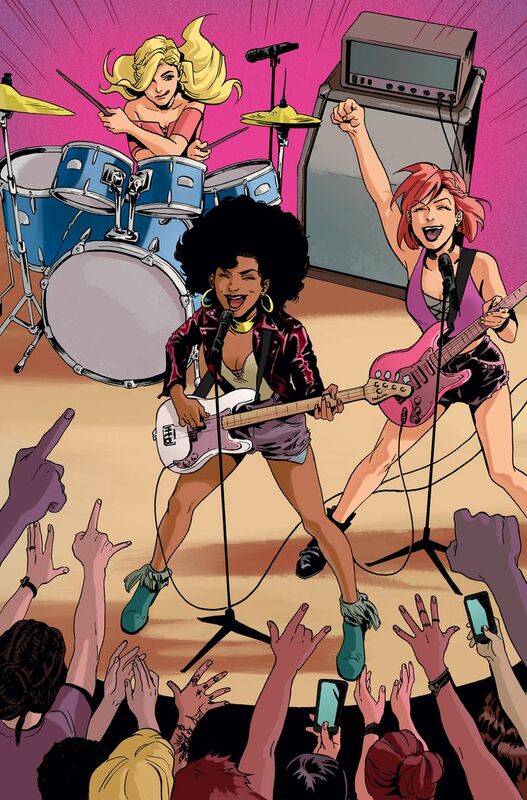 To be frank, Fangirls, before reading this comic I knew almost nothing about Josie and the Pussycats. I remember listening to a version of Sugar, Sugar on my Saturday Morning Cartoons CD when I was little, and I vaguely remember there being a movie several years back, but that’s it. But, being a lover of powerful ladies, when I saw the updated look of the Pussycats at the comic shop the other day, I couldn’t not pick it up. 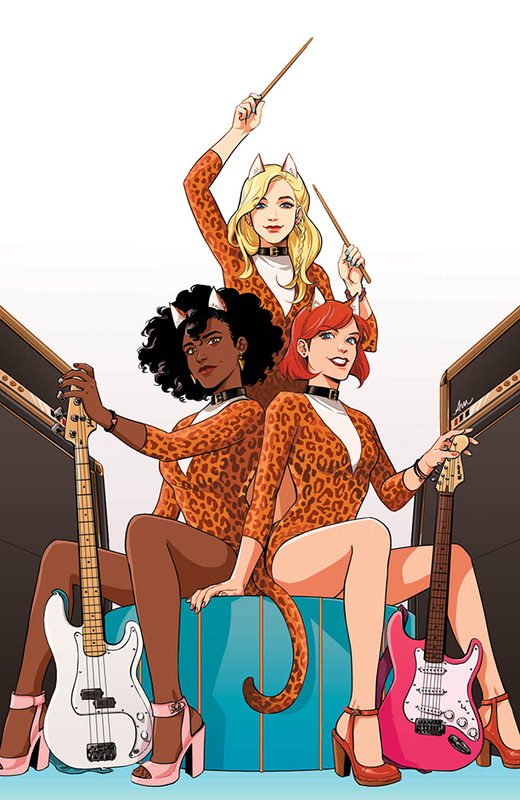 Issue 1 follows the formation of the Pussycats, and thats pretty much it. It starts with Josie singing an unattended “show” that looks more like open mic night. Alexandra comes in to mock her as she’s leaving, but Josie’s mood improves when the bartender shows her a flier for a charity concert that needs music. When Josie gets home and shows Melody, though, she doesn’t seem enthused. Melody has a long week of boys, sports, and school, so she’ll sit this one out. Melody leaves for her date and while she’s walking with her newest beau (fifth one this month), she spots a lost-looking cat. It’s raining and the poor kitty seems pretty bummed, so Melody rushes to it’s side, and picks it up. When her date complains that there isn’t time to take care of the cat and go to a fancy dinner Melody ditches him, and brings the bedraggled kitty home with her. Melody and Josie head to the vet’s office the next day, to make sure the kitty isn’t sick and doesn’t belong to anyone. There, they meet Valerie, a vet with golden pipes. She finishes up work and they rehearse as a trio for the charity concert that’s less than 6 hours away! For pretty obvious reasons, their first song doesn’t do so well. Josie’s voice isn’t the greatest, and she still has Valerie on backup vocals. Alexandra comes by to stir up some trouble amongst the ranks. She tells Melody that Josie is intentionally making the songs hard for her, and Valerie that Josie is refusing to take backup, even though she can’t sing as well. When the girls approach Josie about these concerns, Josie apologizes and rights her mistake. Val takes over as lead, Melody chooses the songs, and they do great! After the show they’re introduced to a gent with the claim that he’ll be making them famous, and Melody tells him that they’re the Pussycats, Val adding in “Josie and the” afterwards. Most of the comic ends with that, but there’s still more to the issue. This issue features a page’s worth of information on the history of Josie and the Pussycats, which I loved (since I knew nothing about it). It was started when Dan DeCarlo (of Archie) met a french model named Josette. She and DeCarlo were married, and she inspired Josie! But the name Josie and the Pussycats wasn’t finalized until it’s 45th issue. There’s a ton more information in there, and it really helped round out some of the questions I had about Josie, so that was a phenomenal addition. There’s also an old Josie comic in the back, so we could read the differences between the two! I really enjoyed reading this, and it may be one of the reasons I actually start a pull box again. It would be nice to have regular comics again, and get to follow a story instead of picking it up whenever I think of it (hello, Saga, I miss you). But for now, that’s all. If you haven’t already, and you like reading about women following their dreams, I highly suggest checking out Josie and the Pussycats. The writing is done by Marguerite Bennett, with art from Cameron Deordio and Audrey Mok. It’s a pretty rad team, and they’re making a great comic.